Reprinted from Victuals. Copyright © 2016 by Ronni Lundy. Photographs copyright © 2016 by Johnny Autry. Published by Clarkson Potter/Publishers, an imprint of Penguin Random House, LLC. I’ve been busy lately. There hasn’t been much cooking going on in my kitchen, beyond the bare minimum. And I’m a little sad to say I haven’t made any of the recipes in this gorgeous volume. But the beauty of this book is that it’s about more than just food. It’s about history, tradition, and comfort. It’s about the stories we tell with food. It’s a satisfying read, regardless of whether we’re cooking each recipe in our own kitchen or not. Luckily the folks at Clarkson Potter were kind enough to let me excerpt photos and recipes directly from the book. Below are recipes for a sweet and savory banana pudding, potato rosti, and a special clabber sauce. If you have a little time on your hands, try them out yourself. 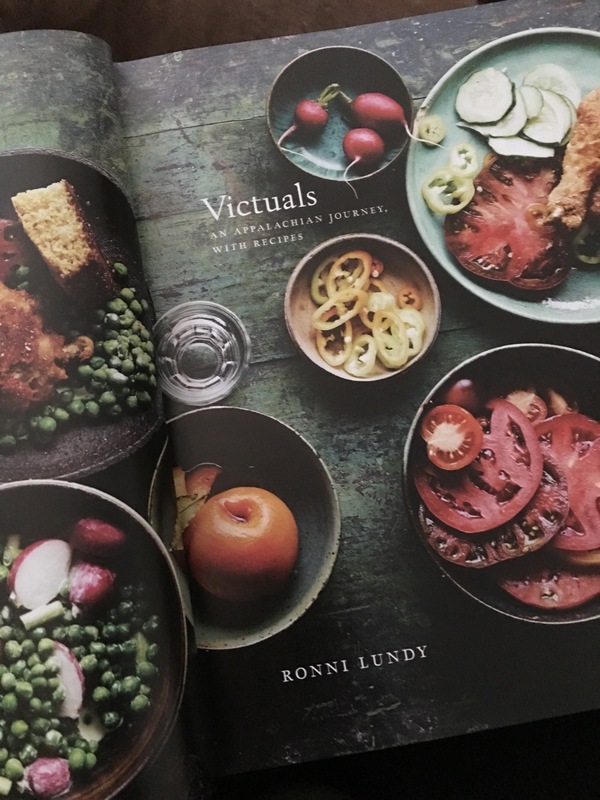 You can find Victuals on Amazon, in bookstores, and directly from the publisher. Peel the potatoes and grate them on the large holes of a box grater. Lift a handful of grated potatoes and squeeze it over a bowl or the sink to drain off as much liquid as possible. Drop the squeezed potatoes into a bowl and continue until all the potatoes are squeezed. Sprinkle the salt over the potatoes and add black pepper to your taste. I like a lot, some like less. Toss to distribute the seasoning. Place a wide, heavy skillet over medium heat and melt the bacon grease in it. It should cover the bottom of the pan, about ⅛ inch deep. When it begins to shimmer, flick a piece of grated potato into the hot grease. If it sizzles instantly, add the rest of the potatoes, a spatula or spoonful at a time. Do this gently as you don’t want the grease to bounce and burn you. Cook until the underside is a deep, crispy brown and the top potatoes are turning translucent; this takes 10 to 15 minutes. Keep an eye on the potatoes while they are cooking and turn the heat down to keep them from burning, if needed. Conversely, if the top potatoes are translucent but the bottom is not crisply brown, turn the heat up a bit to quickly darken it. Cook the second side for 7 to 10 minutes, until brown and crisped. Remove the rösti from the pan, let it drain briefly on paper towels, and then serve it immediately on a warmed platter. Pass the “Clabber,” Chive, and Caper Tater Sauce. In a small bowl, mix the yogurt, mayonnaise, chives, capers, caper juice, and vinegar together. Taste, and add salt according to how you are going to use the sauce (less if a dip for salty chips or on top of well-salted rösti, a bit more if dressing potato salad or a baked potato). It can be served immediately, but is best if covered and refrigerated for at least an hour ahead of time. Make the pudding: Whisk the egg yolks, sugar, and salt together in a large bowl. Set aside. Pour ¼ cup of the cream into a small bowl. Sprinkle the gelatin over the cream and stir with a fork until incorporated. Let sit for 5 minutes. Pour the remaining 3¾ cups cream into a saucepan and whisk in the gelatin-cream mixture. Scrape the seeds from the vanilla beans into the cream. Heat over medium-low heat, bringing the cream to a point just under a simmer, whisking every so often to incorporate the gelatin. Remove the pan from the heat and very slowly drizzle the cream into the egg mixture while whisking constantly. Pour the mixture through a fine-mesh strainer set over a clean bowl, and transfer it to a refrigerator to chill. For the first hour, whisk the pudding every 15 minutes to incorporate any skin that forms on top. Then cover the pudding with plastic wrap after the last whisk, pressing the wrap directly onto the surface. Let chill for 3 hours. It will be about halfway set at that point. Make the banana bread: Preheat the oven to 300°F and lightly grease a 1-pound (8½ × 4½-inch) loaf pan with butter. Peel the bananas and place them in a blender along with the miso, egg, and brown sugar. Blend until the ingredients are combined and smooth. Mix both flours and the baking soda together in a large bowl. Gently stir the banana mixture into the flour until just incorporated, and then drizzle in the melted butter. Be careful not to overmix, as that would result in a less tender bread. Pour the batter into the prepared loaf pan and bake for 30 to 35 minutes. The bread is done when a toothpick inserted into the center comes out moist but not wet. Turn out on a rack and allow to cool completely. Use your hands to break into coarse crumbs. Make the banana pudding: In either individual mason jars or a single large baking dish, arrange alternating layers of pudding, bread crumbs, bananas, and vanilla wafers, starting with pudding on the bottom and ending with wafers on the top. Be sure all the banana slices are completely covered by pudding to prevent browning. Refrigerate, covered, for 4 hours or overnight before serving, so that the pudding can finish setting. Let me know how it turns out if you do! So many recipes from this book ended up on my to-make list!